The BGO shield consists of a left half and a right half which fit in clamshell fashion around the germanium detector; each half is viewed by three bottom-mounted photomultiplier tubes powered with a 1200 V high-voltage supply. The shield defines the aperture angle of the detector (approximately 23° half width) and suppresses unwanted background from such sources as cosmic rays and trapped charged particles, radioactive decays, and Compton-scattered gamma rays. 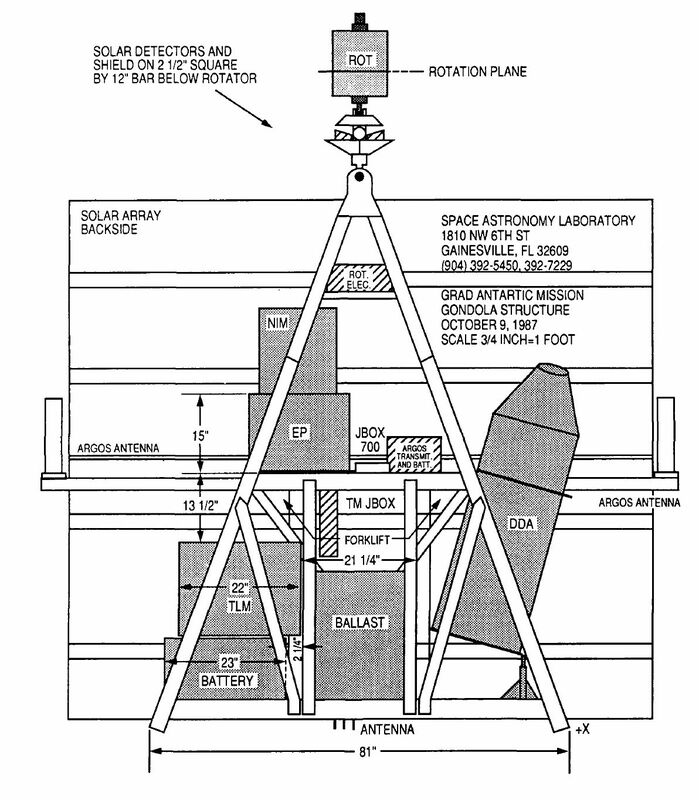 The instrument operated with azimuthal pointing only, fixed at a zenith angle of 21º. The entire gondola rotated around its vertical axis in a fixed cycle: one hour pointing at the supernova followed by 55 minutes pointed off the supernova. GRAD was scheduled to fly on a Space Shuttle mission in 1987 but was sidelined after the Challenger disaster in January of that year. The instrument had therefore already been constructed, tested, and completely qualified for spaceflight when the supernova SN1987A was discovered in the southern hemisphere sky. By mid-March a group of investigators from the University of Florida, DARPA, and the Goddard Space Flight Center began to consider the adaptation of GRAD to a balloon platform. 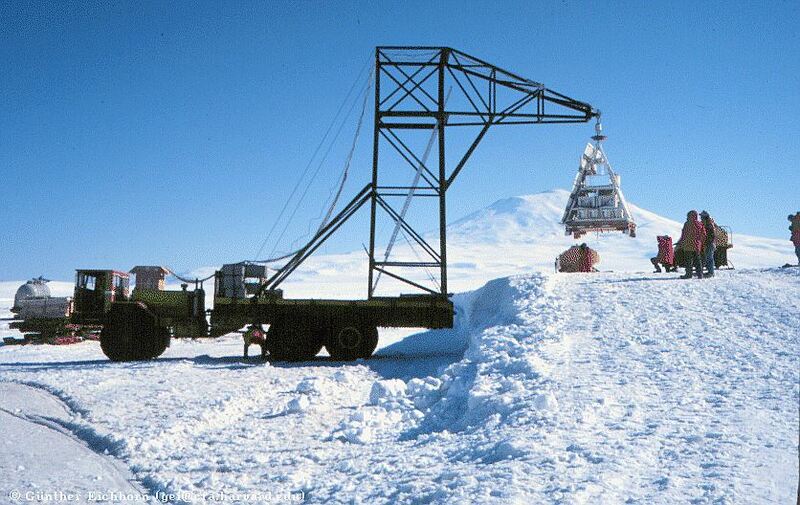 As GRAD was only a single-element spectrometer, to yield usable data on the gamma ray emission of SN1987A a greater length of observation time on the target was necessary so the only site possible to obtain a long duration balloon was Antarctica. More over, the late December-mid January launch window coincided almost exactly with the predicted time of maximal gamma-ray flux from SN1987A. 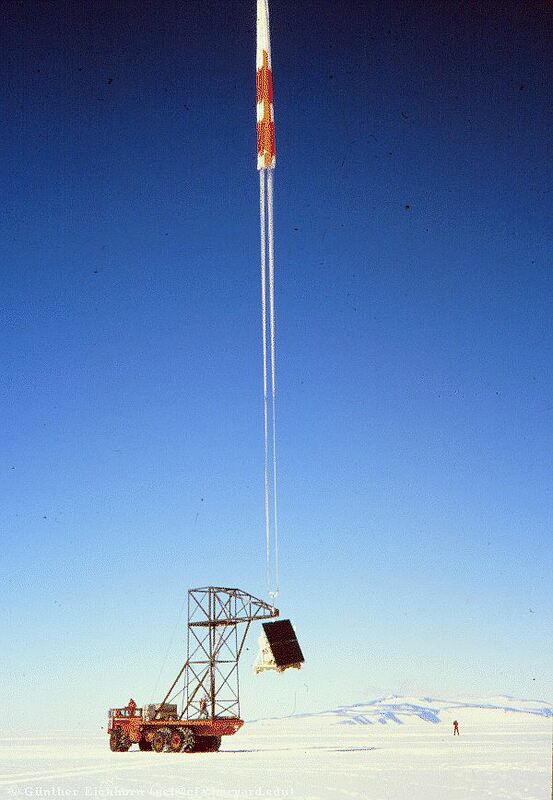 After contacting the Air Force Geophysics Laboratory (in charge of the balloon operations for the Air Force program at Holloman AFB) they accepted the defiant task to launch in short notice, for the first time a balloon of such size in such a remote place. Once fixed the dead line for late November, was neccesary a great effort and coordination of all parties to collapse the normal work of two years into the few months allotted by natural circumstances. A careful planning and the search for practical and simple solutions led to the final design of GRAD's balloon-borne version. For the gondola a light-weight pyramidal design making use of rivets instead of welds was developed, while the pointing system was built based on a solar sensor which produced error signals mimicking those of a magnetometer sensor, so simply replaced the latter with the former in the controller of the gondola rotor system thus achieving azimuthal pointing to within 2 degrees of accuracy. The balloon power system was based on commercially available solar panels and silver-zinc batteries. Four of these independently supplied power to the spectrometer, the main and backup telemetry systems, and the pointing mechanism while the other two additional units served as backups. The tracking system was based on two redundant ARGOS transmitters for the ARGOS satellite navigation system. Coordinates of the balloon were periodically relayed by satellite to the ARGOS ground stations in France and the United States, then by data link to Los Angeles, and from there back to Antarctica via INMARSAT. 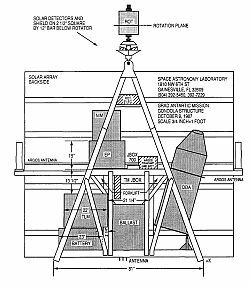 The great challenge was to build the airborne telemetry and command station: it would be portable as nobody knew the kind of aircraft that would be available for tracking the balloon, and would not be possible to make any modification to its external structure. The solution was to install the transmitting and receiving antennas into a spare cover for a forward emergency escape hatch located above the navigator's station on the C-130 aircraft. The modified cover could then be transferred from one fuselage to another without impeding the function of the emergency exit. Having met all milestones in the planning and construction phase (see below) the GRAD team came together at Holloman Air Force Base on October to commence with the integration and test phase of the project. After this all the elements were transfered to Antarctica. The field team composed of 20 experimenters and the launch crew arrived to McMurdo station December 16. The payload and ground support equipment were unpacked, reassembled, and tested at the base, while the telemetry ground station and launch equipment were being prepared at Williams Field airport, located about 15 km to the east. By 31 December the payload was rolled out and moved from the base to the launch site on the bed of a Delta 3 vehicle. At the airfield it was installed in a available garage where it underwent yet another set of calibrations and checks, operating continuously for several days. On January 6 -two days before launch- the payload was transported from the garage and moved up an ice ramp to the gantry, where it was suspended from the rotor mechanism. A full system test was succesfuly performed so the target launch date was set for 4:00 h local time on 8 January. As the hour approached the windspeed remained above the maximum allowable for a safe launch, however at 7:30 h the wind dropped below the limit, and the director gave the signal to go for launch. Final countdown checks were made, and all systems were found to be in order. At 11:05 h the launch director ordered the crew to inflate the balloon; and at 12:15 h, under nearly perfect conditions, it was launched by dynamic method. Approximately 140 minutes after release, GRAD reached float altitude of 36.1 km. During the first 19 hours at float altitude, the balloon remained within the 360-km range of the telemetry station at Williams Field. It then continued westward over the horizon following the 78th parallel. On the third day of the mission, althought the flight was developing flawlessly from the ballooning viewpoint was evident that something went wrong with the electrical power of the experiment. Thus an LC-130 carrying the airborne telemetry station and its crew left Williams Field for a rendezvous with the balloon over the polar ice cap near the Soviet base Vostok. The team faced two options: terminating the flight in the vicinity of its present position, they had good chances for a quick recovery, and assuming minimum damage at impact, the malfunctioning power supplies could be replaced at Williams Field, and GRAD could be launched again that season. On the other hand, by allowing the flight to continue on its trajectory, it would circumnavigate the South Pole for the first time in history, reaching an important milestone in the history of scientific ballooning, but losing reflight chances. After a while, was decided that the supernova data was a higher priority than a historical flight, so the balloon was brought down at 11:00 h McMurdo time on January 11, after traveling 1440 km from the launch base in a westward path. The payload took about 15 minutes to come down. 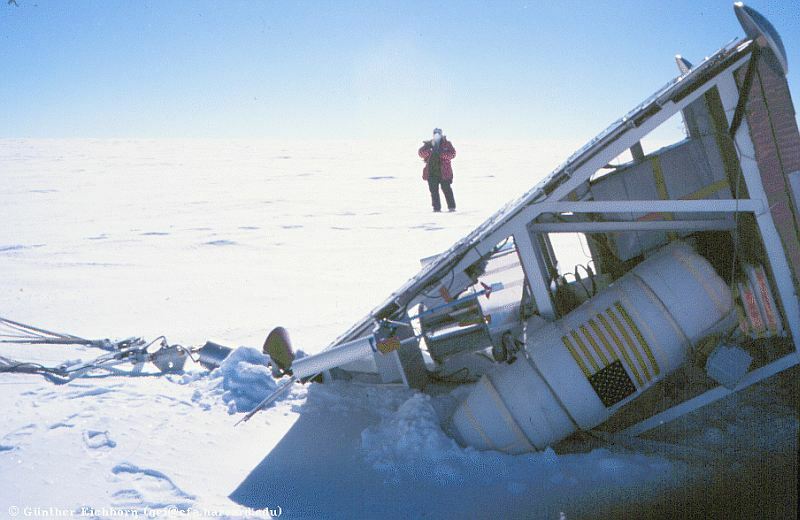 Once on the ground, the parachute was supposed to be released from the payload, but instead it failed to detach and dragged the gondola several meters through the snow. 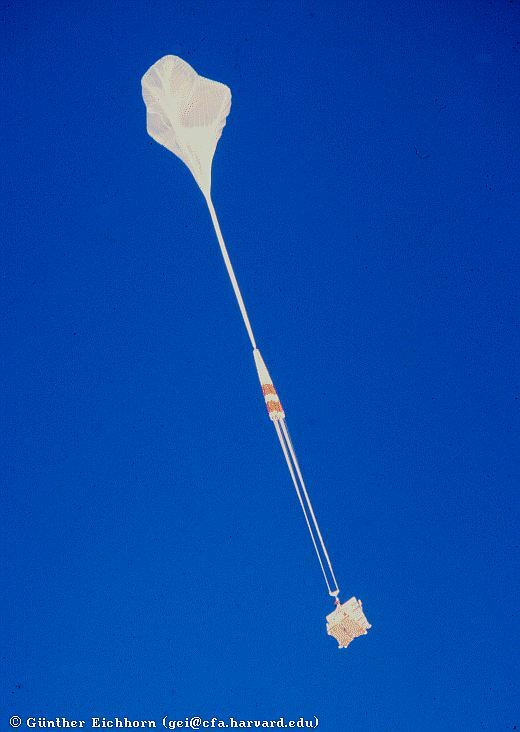 The failure was not a failure at all: the release system is armed only below 10,000 feet of altitude (to prevent an accidental release of the payload in flight) and the team hadn't taken into account that the plateau height at the impact point was over 12,000 feet, meaning that the safety system never enabled the parachute release. On 12 January the payload recovery team, after a search of near two hours finally spotted the impact site. They landed the LC-130 aircraft and started to prepare the gondola to be introduced in the rear part of it. They were short in time, pulling the gondola by hand -with the only help of one Ski-Doo- and breathing oxygen every few minutes. Finally in one hour they managed to put GRAD inside the LC-130, and after several runs over the snow to reach takeoff speed, the aircraft managed to get airborne with it's cargo. The adventure ended at 0000 h local time on 13 January, when they finally landed back at Williams Field. The payload was then transferred to the maintenance garage at the airport for inspection. While the ballooning part of the mission was proceeding with textbook perfection, the experiment itself had developed problems. Ten hours and fifty minutes into the mission, the output voltage of one of the supplies for the BGO shield dropped decreasing the background supression introduing unwanted contaminant peaks into the spectra. Six hours later that failure rendered half of the shield inoperable so for their studies the scientists restricted their dataset analysis to the initial portion of flight when GRAD was fully operative. The first analysis detected gamma ray lines associated to the 847 kev and 1238 kev transitions in FE(56) from the radioactive decay of CO(56). Also anisotropic features in the background were detected. 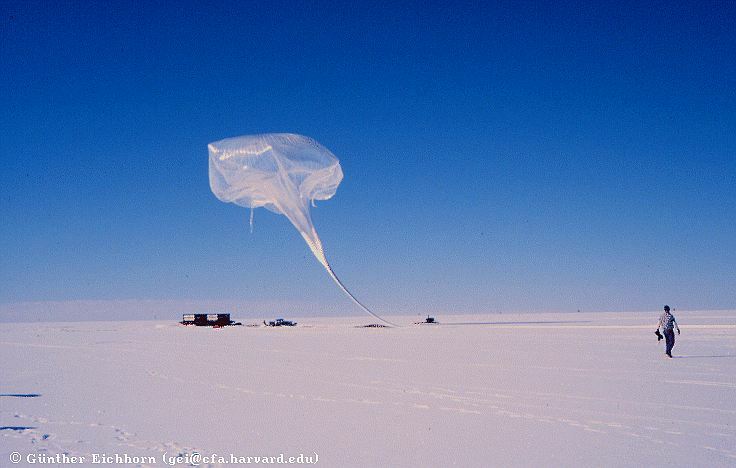 - The launching for the first time of a very large, zero pressure balloon at Antarctica. 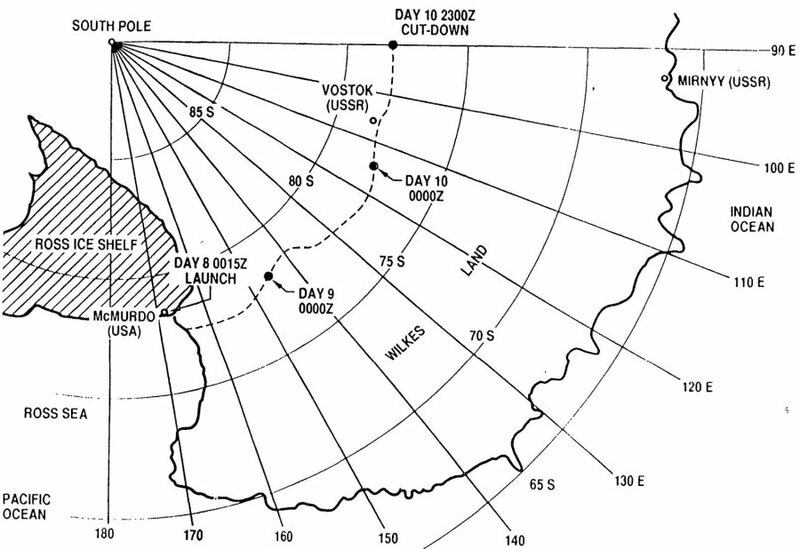 - Although the flight lasted only three days; circumpolar flights lasting 12 to 14 days were shown to be feasible. - The tracking of the balloon with the ARGOS satellite navigation system was demonstrated. - A data link between a balloon in flight and an airborne telemetry station was developed and first used.